The regional scientific community had the pleasure of receiving Dr Weiping Hao, Deputy Director General (Department of International Cooperation) accompanied by Dr Weiping Hao. Dandan Huang (Chief for Multilateral Cooperation). At the request of its government, CAAS wishes to expand and consolidate its international development, particularly with European organisations. In France, the long-standing collaboration with two Agropolis International members: CIRAD and INRA has been established through bilateral agreements. In Montpellier, several presentations were made for the delegation: presentation of Agropolis International; Labex Europe of Embrapa, Labintex of INTA, I-Site MUSE. Thematic visits were organized: AGAP joint research unit; ECOTRON platform, medical laboratory (University of Montpellier). 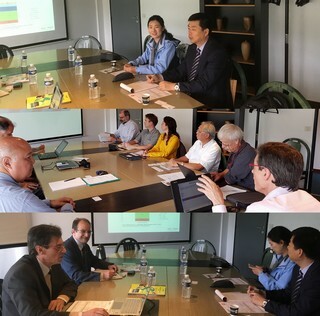 Several partnership proposals were discussed, notably around the concept of a laboratory without walls located in Montpellier, emblematic models of cooperation already set up by Embrapa (Brazil), INTA (Argentina) and UPM (Malaysia). CAAS, is a world-class sci-tech research institution being a national-level international agricultural S&T center for scientific innovation, international Cooperation, and talents cultivation height. key figures: Cooperation with: 83 countries and regions, 38 international organizations, 7 MNCs and Gates Foundation with 82 agreements signed ; 13 representative offices of international organizations ; 62 joint laboratories ;4 overseas joint laboratories were established in Brazil, Belgium, Australia and Kazakhs.